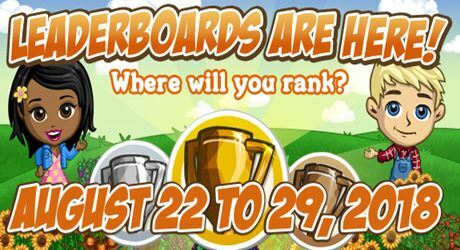 Here are the details for the next #FarmVille Leaderboards Challenge that will run from August 22 to 29 2018. To participate, simply do the following tasks. There are 3 tasks that you can choose from or you have also the option to do all 3 tasks and win it’s corresponding reward. Harvest GLORYBLOWER to get to the top of the list! 1 day to grow and harvest. Harvest WHITE CHERIMOYA (THE FRONTIER TRAIL) to get to the top of the list! 8 hours to grow and harvest. Make BUSHEL BASKETS at FRONTIER STORE (THE FRONTIER TRAIL). It will take 2 hours to make one and you will need American Persimmon Bushel x3, Gold Acorn Bushel x3 and Yellow Sunchoke Bushel x3.